Absolutely love my momentary escape from reality where I'm completely pampered. Thanks so much. Professional and classy, versatile cut allowing natural curl or smooth blow waved look, and importantly healthy looking hair. Looking forward to a tint and foils next time to cover a multitude of colours for a natural look. This grandma is finally getting her act together thanks to Colin. Thank you so much Vivienne we are so glad you are happy. We really enjoyed looking after you and we hope to see you soon! 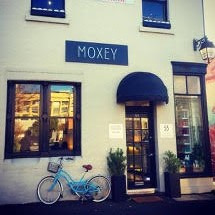 I have two girlfriends who have often spoken highly of Colin Moxey Hairdressing (CMH) ... I used to wonder why they came from the other side of town. Well an impromptu appointment one Saturday morning has given me my own insight... wow ... Wow ... WOW! I felt welcomed from the moment I stepped in the door with a warm and gently familiar introduction to the oasis that is CMH. Real people, professional spot on advice combined with relaxed conversation that was like picking up with an old friend after having not seen them for a while. I felt cocooned and nourished rather than pulled, knocked and blown away. And this was visit number 1. I will be back and in the meantime I highly recommend CMH. Thank you so much for this amazing review Janelle! We are absolutely delighted that you have found us and we live up to your expectations and are so glad you feel at home with us. Looking forward to seeing you soon!